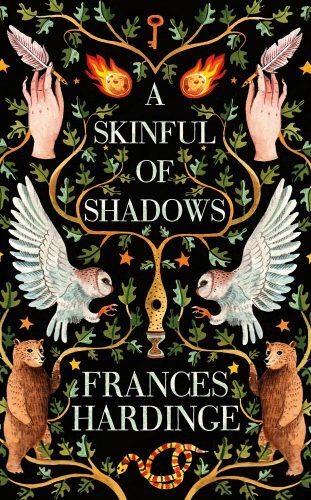 For her eighth book, a YA historical fantasy set during the English Civil Wars, Frances Hardinge has chosen to engage with a time period that complements her own established interest in unsettling expectation. By doing so, she both reaps many narrative rewards, and sets herself some methodological challenges. The Civil War era in Britain witnessed, at times, the widespread political success of “an insurgent radicalism from below” (Zagorin, Rebels and Rulers II, p. 130), and the memory, or idea, of that epoch-altering radicalism approaches so near to the agile, contrarian matter of Hardinge’s own fiction that some scenes in A Skinful of Shadows feel like face-offs between Parts of the Actual Seventeenth Century and the work Hardinge is doing with them. What’s at stake in these moments of confrontation, where an expert writer regards real events that could quite plausibly contain some of the ideological underpinnings of her own canon? I don’t claim to know, but they make this a very interesting book indeed, a nervier and more fraught undertaking than one might think on first taking it up. It is also a skillfully constructed work of fierce and innovative supernatural fiction, and it features a terrific female protagonist. Her name, Makepeace Fellmotte—or, perhaps, Makepeace Lightfoot—serves as introduction (though no more than that). Lightfoot is Makepeace’s mother’s surname. It speaks, of course, of mobility: and it whispers of freedom, or even joy. In the usual order of things it wouldn’t be heritable, but these are strange times, about to be rendered stranger by the protagonist herself. Fellmotte, “a terrible fortress,” foreshadows the plot-presence of Makepeace’s father’s ancestral home, Grizehayes, and the reckoning she will have to make with it. “Makepeace” seems to identify her as a Puritan, a member of a prescriptive Christian subculture that rejoices in saddling its children with clunky, doctrinally inspired names. This being a Hardinge novel, however, that’s not even close to the whole story. Makepeace’s name is actually part of an elaborate protective gambit undertaken by her light-footed (though not light-hearted) mother, who brought her—out of mystery, in haste—to the Puritan town of Poplar as an infant. Feeling “a bit unreal,” suffering from absences and gaps, is Makepeace’s inheritance through her dead father, Sir Peter Fellmotte. It also turns out to be a source of unexpected power. Over the course of the novel, the internal blanks and spaces that initially trouble Makepeace start to become homes for the other intelligences she begins to meet when the small, badly fitting world of Poplar ejects her. And, in becoming a refuge and dwelling-place for others, Makepeace simultaneously settles into herself. The final words of the book are, “You’re among friends …You’re home,” which can be read: You’re among friends and you, yourself, are [your] home. These are, I daresay, words most readers can use. But they seem particularly, and lovingly, offered to Hardinge’s YA audience. 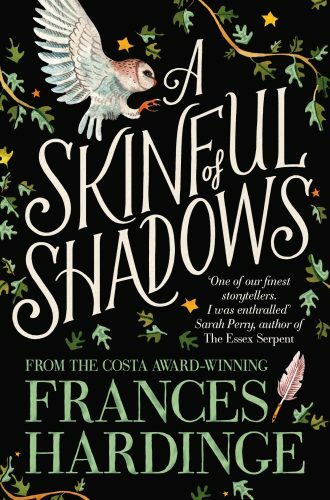 A Skinful of Shadows asks: in a world turned upside-down—or “turning cartwheels” (p. 209)—can Makepeace find ways to trade a gapped identity, a sense of not knowing what her “foundation” is, for a hospitable, and portable, self that functions in some respects like a consensus-driven communal entity? This is terribly hard work, and Hardinge makes that clear. There’s also a humdinger of a follow-up question: can Makepeace avoid having her body commandeered, her consciousness exterminated, by the ancient and malign spirits that constitute her extended paternal family? Because that’s part of the mix too. After her stable, constricted life in Poplar disintegrates, Makepeace learns she has inherited the Fellmotte ability to serve as a living host for the spirits of the dead. This means her father’s relations will try to find and control her, in case they need to use her as an unwilling (and disposable) vessel for the minds of the most ancient and powerful members of the family. But Makepeace may be able to wield her uncanny talent for her own benefit if she can learn how to manage it fast enough. If she can survive her own guilt, and grief, at Margaret Lightfoot’s painful and undignified death: and if she can survive, somehow, with Bear. It’s crucial to the plot and ethos of the book that Makepeace gains a non-human inhabitant ghost, Bear, just after she loses her mother forever, and just before the Fellmottes swoop in to collect her. Margaret Lightfoot has been a harsh parent. In a different, more widely solicitous book we might get more narrated insight into her reasons for keeping her daughter at arm’s length, but Hardinge focuses unwaveringly on Makepeace’s experience, and lets the pain of the relationship stand. Margaret doesn’t tell Makepeace why she must spend the night alone in graveyards starting at the age of ten, and why the dead then try to get inside her mind. She only insists that Makepeace continue the practice, to“sharpen her stick”; i.e., to develop her defenses against invasion by the un-housed souls that are irresistibly drawn to the girl as to a place of safety. But then Margaret is killed in a London riot against the King’s detested Archbishop, William Laud—a riot that’s a forerunner of war—and all of her rough lessons in self-protection are needed at once. Makepeace must first defend herself against what seems to be the desperate ghost of her own mother, in a wrenching scene that makes for very hard reading indeed; and shortly thereafter acquires her first passenger-ghost, when she travels to the marshes near Poplar in search of an angry haunt she believes may be the spurned soul of Margaret Lightfoot. It isn’t. It’s Bear, abused and abandoned in life, and furious in death. A dancing-bear, forced to perform all along the provincial roads of seventeenth-century England by owners who left him to expire in a ditch when his health failed. The wordless, wounded fury of his ghost, and its loneliness, chime with Makepeace’s state of complicated grief, and she suffers something like a preliminary possession through proximity to Bear’s corpse. “[Bear’s ghost] blundered against her, hot, terrible and oblivious. The world swam, and then she barely knew where she was, who she was. She was swallowed by a memory that was not her own” (p. 36). Struggling out from the marsh where Bear’s body lies in a posture of final agony, Makepeace returns to a water-side tavern where his handlers and betrayers are having a drink and sourly contemplating the loss of their source of revenue. She makes quite an entrance. If you have warm feelings for animal rights and furious, justice-hungry, pro-animal-rights teenage girls, this is what they call Quite a Moment. I don’t usually jump up and pump my fist while I’m reading, but I can’t say for sure I didn’t here. And yes, you’d be right to be worried about what’s going to happen to Makepeace next; except that Bear’s ghost thunders in to rescue her, and to be rescued. Only Makepeace could see [Bear fighting the men]. Only she could see how…rage was burning it away…. …Reflexively she put out both her arms, encircling the raging shadow. All she wanted in that moment was…to hold the Bear together and stop it melting into nothing. When Makepeace wakes up, Bear is part of her, though it will take both of them a while to realize this. It will take even longer to understand how their partnership, and an increasingly complex, changeable set of subaltern ghostly partnerships, may keep them both from being crushed out of existence by the vampiric, the ancient, the unmerciful Fellmottes—who are coming, who are on their way. Here’s where I pause to make some observations about the unique ways Hardinge deploys received themes. In order to do so, I will have to skip over a lot of other things in and about A Skinful of Shadows. Briefly, to the question, “does Hardinge manage the notorious and eventful historical context in a way that avoids outrageous distortion while still primarily serving the needs of her plot?”—yes. To the question, “does she, as in previous works (viz. The Lie Tree, 2015) continue to depict her main female and male characters as prickly, intelligent, and realistically fallible; their friendship valuable for its ability to deepen through repair, rather than its shot-proof and foreordained perfection?”—indeed. Wait until you meet James Winnersh, Makepeace’s friendly and reckless half-brother: just wait! The bear-as-guardian of girls, the bear-as-nurse, the mother-adjacent bear (or bearlike beast): this is a trope with a long history. It’s been used a lot in genre fiction, from Naomi Mitchison’s Travel Light (1952) where the infant princess Halla is saved from death-by-exposure by a magical Finnish nurse who happens to be a werebear, to Madeline L’Engle’s A Wrinkle in Time (1962) where Aunt Beast heals the dangerously ill Meg Murray, and on into contemporary treatments like Martin Cahill’s short story “Bear Language” (Fireside Fiction, 2017) which skillfully uses and further develops the main elements of the theme of the bear-nurse. These elements include the careful guarding and as-needed healing of female protagonists, undertaken by a creature whose physical stance and behaviors can mimic the human without necessarily conjuring it: and whose thick soft pelt and ability to hibernate give rise to a therapeutic imaginary—the dream of safe, companionate, reparative sleep. At the same time, the bear-nurse’s strength and protective ferocity stand as a threat and rebuke to what is malign in humanity, and the education she offers her charges teaches them to look out for themselves in the world of “man.” What manner of education? Bear-nurses excel as instructors of embodied, extra-verbal perception and communication. The works listed above all contain scenes of bear-teaching that insist young women must have reference to the full range of their senses, and all manner of communicative acts outwith speech and writing, in order to survive and flourish. Makepeace is using one variant of bear-language when she strikes Bear’s tormentor in the nose. She accesses a different register of bear-language later in the book, several years after she’s forcibly brought to Grizehayes, where her status hovers at the pernicious intersection of “dependent relative,” “prisoner,” “sacrificial victim,” and “servant.” But all of that can be forgotten for a while as she moves secretly on hands and knees through the estate’s kitchen-garden in the company of her bear-nurse, who in Hardinge’s telling is also a foster-bear; a rescued bear in the process of careful rehabilitation. …at such an early hour…nobody else would see her…letting Bear contentedly amble her body through the cold, dew-laden grass. As long as she stayed in the right part of the garden, the enclosing wall concealed her from Grizehayes’s windows. A couple of points here. First, this is the unique interpretation of the bear-nurse trope I was talking about. Usually, bear-nurses take care of abandoned or threatened girls, but in Hardinge’s fiercely pro-girl reworking, bears and girls establish pacts for mutual defense and aid. (This will come into focus even more clearly and affectingly when Makepeace must revisit the scene of her mother’s death, much later in the book.) Second: the scene above, where Makepeace participates in Bear’s morning ramble, is crucial to advancing the plot. The “sharpening” of Makepeace’s vision, which comes through her cooperative experience of Bear’s bodily comfort, her participation in his interpretative field of “damp scents and mysteries,” is immediately put to use when her hidden presence in the garden—bearlike, on all fours—allows her to overhear and analyze a crucial discussion between two of her Fellmotte captors. This piece of unintentional but thorough intelligence work is a first step on the long, dangerous road of escape from Grizehayes. It is an early forerunner of a possible new life. Once she and Bear brawl their way free of the Fellmottes—bruisingly, in extremis, in terror—they will become, for a time, a wartime spy: a “she-intelligenc[er]” (p. 197). The topic of spying raises the question of taking sides, in a divided country. The human habit of declaring allegiance-unto-death to one sharply defined political faction comes in for close and skeptical attention in A Skinful of Shadows. The novel insists over and over that individuals are best served when they declare allegiance not to a “side” but to a politically diverse set of sustaining relationships established through mutual help and hard-won familiarity. As she travels, and scrambles to survive, Makepeace acquires interesting ghosts from all over the Royalist-Parliamentarian spectrum, and when she does so, she has to engage with their furious disagreements. Here, she is about to wade into it with the Royalist Dr. Quick—whom she admitted as a resident after he died in Oxford of camp-fever—and the Parliamentarian soldier Livewell Tyler, whom she took on board out of pity after he came to a miserable end over a stolen chicken. I am sorry, Master Tyler, she told him, but I do not give two crushed peas who wins this war. Instantly chaos broke out in her head. The reluctantly literal bear-mother of Pixar’s 2012 Brave, whose storyline seems to tangle (in parts) with that of the nymph Callisto, is a different kettle of fish. Catherine Rockwood is a poet and independent scholar based in Massachusetts. She gets verklempt in rare-book libraries and the SF/F section of well-stocked bookstores. Essays and reviews in (or forthcoming from) Rain Taxi, Mom Egg Review, and Tin House. Poetry in concīs, Antiphon, Upstart, and elsewhere.